Nancy is the baritone in The MIX and has sung in three medal winning choruses – the White Rosettes, Cheshire Chord Company and Heartbeat – since joining barbershop in 1989 (when she was 3…). 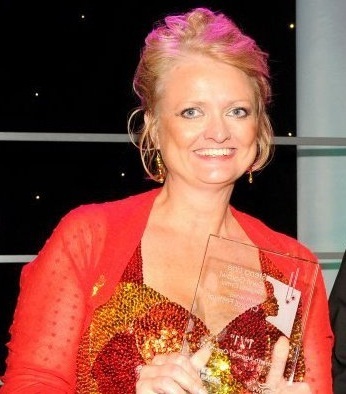 Since 2010 Nancy has been the director of Heartbeat Chorus, based in Marple, Cheshire. Despite not directing before taking over the role, in 2012 she achieved the certification of ‘Master Director’ by scoring over 600 points and passing the Sweet Adelines directors’ education programme. Nancy is also a singing judge in LABBS and currently head of the category. She has lots of experience coaching quartets and choruses. Nancy used to be a lawyer until she gave up work to be with her three year old daughter and make lovely home cooked meals for her husband, Simon. Her daughter, when asked what ‘mummy is good at’, replied ‘washing up’. Nancy is glad all those years of education and being partner in a top law firm haven’t gone to waste.